I love sharing delightful travel experiences with readers, and that’s why I’m thrilled to tell you about our Southern Hospitality Getaway to Lake Charles, Louisiana. The Lake Charles area is a fun place to visit with a full calendar of over 75 festivals celebrating local heritage, each year. Lake Charles is also home to the second largest Mardi Gras celebration in the state. Lake Charles is an ideal stop for a weekend getaway. Within several hours, you can pack your bags, hop into the car, and explore new things. Our Southern Hospitality Giveaway features a two-night stay at the Best Western PLUS Prien Lake Inn & Suites, and that is only the beginning. The Southwest Louisiana area has a lot to offer travelers seeking outdoor adventures, entertainment and incredible food. Start off the weekend with a dinner for two at the Delta Downs Racetrack Casino & Hotel Rosewater Grill & Tavern. Then share $100 for casino games and another $100 for the Lagniappe gift shop. Next, enjoy a day of golfing at the Country Club at Golden Nugget. The Golden Nugget Lake Charles is the newest resort in the area with a championship golf course, lazy river swimming pool and 12 restaurants. The manicured green is framed by the property’s native bayou land. Every hole offers varied levels and provides a spectacular backdrop for guests seeking a getaway within their getaway. That evening, the winner will enjoy another dinner for two at the Otis & Henry’s Bar and Grill located within the Isle of Capri Casino Hotel. The menu offers steakhouse favorites with a comfortable bar and grill atmosphere. End your weekend having relaxed your mind, body, and soul with a Spa Day at Spa du Lau in L’Auberge Casino Resort. The winner can choose two 50 minute-services. Choose from any of their full body massages, facials, or salon services. 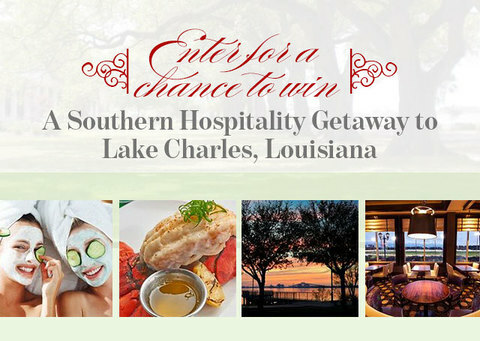 To enter, follow the link for the Southern Hospitality Giveaway, and then fill out the form with your information. Whether or not you win the giveaway, I hope this inspires you to venture to one of the South’s most exciting destinations. I love the Southwest Louisiana area, and I think you will, too. I too would love to visit south LA! Wish you would have the Southern Lady weekend celebration again. 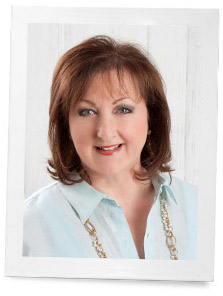 I was a new widow when it was held in Savannah and it was so inspiring and the hospitality was just what I needed. The good feeling lasted a long time. I totally agree with you. I miss Southern Lady Celebrations too! I too got so much out of it and the hospitality of the event and the participants was just perfect and it always inspired me to get things done and be productive!! What fun! As the weather changes, it’s a perfect time for a getaway. What a fun time this would be!! I am Kathy McMahon from Thunder Bay, Ontario Canada (Northern Ontario). What I would give to spend a wonderful weekend in the southern state, enjoying the warmth, good food, golf and OMG a spa day. John and I would thoroughly enjoy this get away from our busy days and evenings at our trucking company, and may open us up to a new found vacation spot for winters to come. This is a great blog, and I enjoy the magazine immensely. Keep the wonderful issues coming. When my magazines arrive, I sit and read each page very slowly, savouring and dreaming of the south with each turn of the beautifully thought out pages. Tea Time just compliments Victoria Magazine. I love LA and would love to visit again please enter me in the contest. Drive threw on the way to Houston from Alabama, would love to actually stop and see some of the things we see from the Interstate. It’s a beautiful place! My husband and I would love to get away for a while. I love the south and all that their plantations have to show and tell and my husband loved the battle forts. I am curious to see what interesting beauties Louisiana has. 35 years ago, my husband & I drove to New Orleans thru Vicksburg & along the Coast touring Civil War mansions & battle sites. It was the first time either of us had been South & fell in love with the area. I’ll never forget going to Preservation Hall & listening to jazz played by elderly musicians while we sat on rugs on the floor. A few days later, I realized I was pregnant with our first son as we rode the bayou & I turned green as my breakfast decided to not stay down! Such great memories! Our second son has inherited my love of History & recently flew to NO to the WWII museum where my cousins wife’s sister is a docent. My father, who is 103, is a veteran & I also would love to visit the museum plus see the area again, including Lake Charles that sounds like so much fun! I enjoy your posts so much & appreciate this opportunity to apply for this drawing! Thank you! A visit to LA sounds wonderful, as I have never been there. I have a niece and grand niece living near New Orleans. An opportunity to combine two fun trips into one. Thanks for a chance to go. I would love to win this. I was actually born in Lake Charles but left as a very young child and would like to see where I was born! Love traveling down in our southern states. LA is one of our favorites to visit.